I caught up with Double Helix from Austria on the eve of the new release and we discussed some concepts in line with the artwork concepts. DB: Last time when we chatted we had ‘Leviathan / Microgravity’ and now I am looking at the sleeve for THIS release and it’s big concepts again… why did you choose this title? DH: When you look up a picture of a nebula, like the Carina nebula it looks amazing, right? Very sureal. So when I listened to the tune I imagined flying with a spaceship towards this gigantic something. At first you have a lot of little bits passing by and as they become more and more you are suddenly hitting that big something. That’s the moment when the bass comes in. So you are moving deeper and deeper into this strange and mystical something. You are passing through different layers. And then when the break in the middle comes you have this moment like you are breaking through the last layer and burst out of that foggy stuff. Then you see the sun, with a gigantic lens flare and this amazing colourful ocean of gas beneath you. But the ship turns and begins to move again towards this giant mystical something… I think that’s more or less how the name came up! 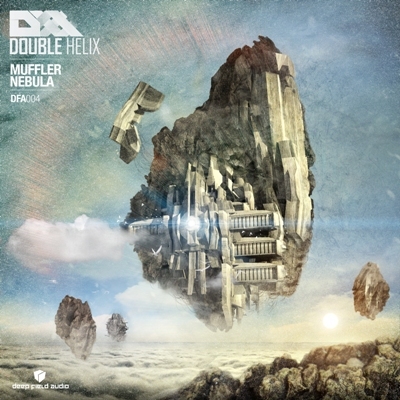 DB: So tell me about the lovely sound of ‘Muffler’ in particular are you proud of this powerful beast? DH: Yeah, I think it turned out pretty good. DB: And ‘Nebula’! You’ve mentioned this already but… what IS a nebula? Yesterday I heard of a black nebula and have no idea what this is either… I assume it’s a cluster of stars. DH: I think the word was used first in the 18th century when they didn’t have the best telescopes and saw this giant star clusters and it looked like a blurry spot, like fog. Later they realized that it was no big fog, so they stopped calling these clusters like that, but some of the names still remaines. Most of the pictures you find on the internet are giant gas fogs that shine in an amazing colour spectrum. DB: Have you changed much over the year as a producer? DH: I think what changed the most is my skill of hearing stuff: music becomes more and more transparent for me when I listen to it. I think, when you break it down that would be the number one, to Train your ears! Try to figure out why stuff is sounding good and why other stuff is not. Most of the time it just takes a minor correction in a sound that means the world. Also one of my top priorities is a good analyser. It really helps you to understand sound. I use the Voxengo Span, it’s freeware and it works just fine. DB: What other studio tips do you have? DH: A very important is cutting. Make space for the important things. For example, if you have a snare drum with the punch at 200hz make a cut in the mids there so the snare has place and can deliver enough pressure without the whole thing going muddy. Or you could sidechain it of course. I also put a lowcut on every channel, except the sub of course. Lot of synths and effects generate unwanted low frequencies so you have to make sure to get rid of them because they could disturb the sub. Also important is to learn a little bit about harmonies, then it’s easier to bring a harmonic groove to it. The famous Amen Break for instance has a snare that punches at 264hz – so it’s a c. It fits perfect with a bassline in f. c and f form a very neutral harmony, that means it doesn’t really trigger an emotion, which is good because you keep the freedom to build the emotion you want upon it. But that’s of course not the way it has to be. I mean, if it sounds awesome, just use it and forget the math. DB: That’s a mini masterclass. Any shouts? DH: Out to the guys from Deep Field Audio to make all this possible. And of course my family, they make my life very colourful and support me when I am busy in the basement! Check the the DFA podcast Vol.3 and get in touch for bookings.